William Mordecai Bowie was the s/o Ursula Burgess & William Sprigg Bowie. In 1809 William married his second cousin, Martha Magruder, d/o Francis Magruder & Barbara Williams. Martha died in 1812 a few months after the birth of their second son, Francis Magruder Bowie. Francis was raised by his aunts, Louisa Magruder and Eleanor W. Magruder, at Dunblane, and from Eleanor he inherited part of that plantation. William and Martha’s elder son, Richard William Bowie, became a physician but died intestate at the age of 49, in 1859. William M. Bowie married again in 1814, to Mary Truman Hilleary. She survived him, but they had no children. Thus, his beneficiaries were his wife, Mary, his surviving son Francis, and his eight grandchildren (Francis’ only daughter plus Richard’s 7 surviving children). An unusual stipulation in the will required his grandsons to renounce any claim to their late father’s estate, leaving all to their sisters. If they refused to do so, they would forfeit their share of his estate. William M. Bowie was a wealthy man, with ample land, cash, and slaves to be parceled out, so the penalty was significant. William M. Bowie left his home plantation, Thorpland, to his g/s William F. Bowie, who died unmarried in 1893. He left another plantation, Brookfield, to his grandsons Thomas T.S. Bowie & Richard Bowie, both of whom died in the 1870s. Thomas managed Brookfield from the time of their father’s death in 1859. Richard W. Bowie’s widow, Margaret Weems Somerville Bowie, lived until 1901. Those named in the will include men named MacDuffie & Joe; a boy named Bill; girls named Emily & Patt. This list makes a poor match with those named in the inventory. No ages are given in either document. Men: Davy $400, Chess $450, George $500, Jackson $400, John $480, Anthony $500, Aaron $500, Rhoderick $450, ; boys: Bill $300, Henry $300; women: Nelly $50, Polly $75, Sally & child $250, Minta(?) $250, Henny & 3 children $600, Rose $400, Mary $400, Maria $50, Rachel $350, Velinda [Verlinda?] $400, Anne & 3 children $800, Anny or Amy $350, Marie or Maria & child $300, Celia & 2 children $600; girls: Maranda $100, Sarah $200, Lizzie $125, Vic $100. Unusual names were often misunderstood and misrecorded, so it’s possible that MacDuffie and Davy are the same person. Joe & Bill appear in both the will and the inventory, but there is no sign of Emily, nor of Patt. Perhaps they were sold or died in the 2 years between the will and inventory, though it seems unlikely slaves who were particularly singled out in 1861 would have been sold. Neither of the granddaughters inheriting those girls were married or turned 21 before 1863, so there is no particular reason to think they would have already received the girls has gifts. Two households away from Roderick Addison in 1880, we find Margaret Bowie, 62, the widow of Richard W. Bowie (household #33). Also in the household are her son William F. Bowie, and her daughters Amelia H., Mary T., & Agnes S. Bowie, and two black servants, Thomas Williams, 15, and Anna Williams, 22. Nearby, in household #45, lived Roderick McGregor (II) (s/o Nathaniel McGregor, and heir of his uncle Roderick McGregor) who had married one of William Mordecai Bowie’s granddaughters, Margaret Elizabeth Bowie. (As noted above, Margaret was to have inherited the girl named Emily.) In their household was another servant named Williams–Martha Williams, 16. 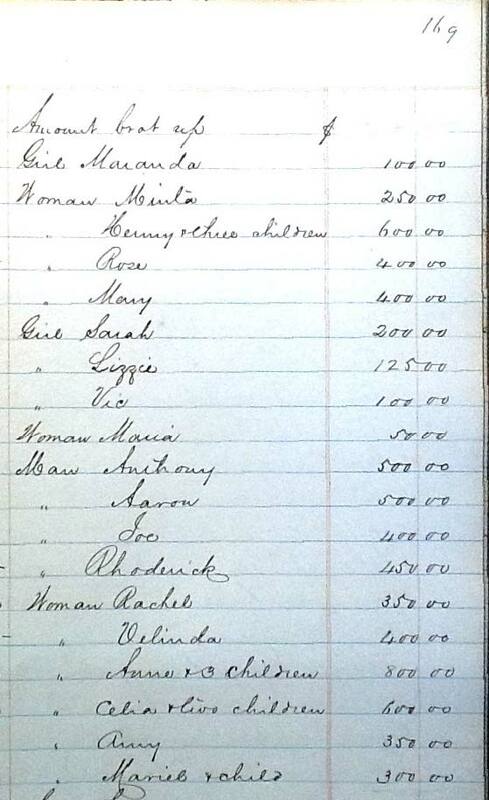 The inventory was filed on 14 March 1863, showing a total value of $17,877.82, of which $10,080 was the value of the 39 slaves. The final administration of accounts for the estate subtracted the value of the slaves and showed a total value of just $7,797. C.C. Magruder says this account was filed on 24 March 1864 and that the slaves had been freed by the 1864 Maryland Constitution, but both those statements cannot be true. The new constitution was not drafted until April of 1864, and passed by voters (with a margin of less than 1%) in October. According to records I found, William M. Bowie’s personal property was sold in May of 1866, with the record of those sales not filed until 1870. William Mordecai Bowie’s estate papers are not preserved in the Maryland Archives. Prince George’s County Register of Wills (Wills) 1854-1873, Liber WAJ, pp 235-238. Will of William M. Bowie, 1863. MSA C1326-8. 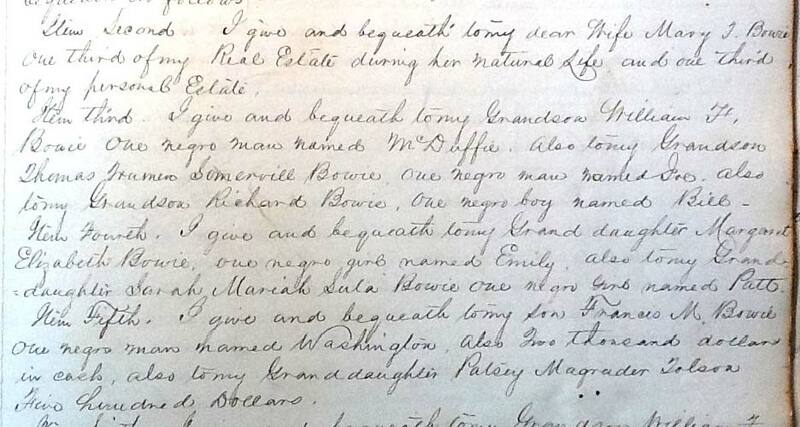 Prince George’s County Register of Wills (Inventories) 1858-1863, Liber WAJ 2, pp 165-170. Inventory of the estate of William M. Bowie, 1863. MSA C1228-30. 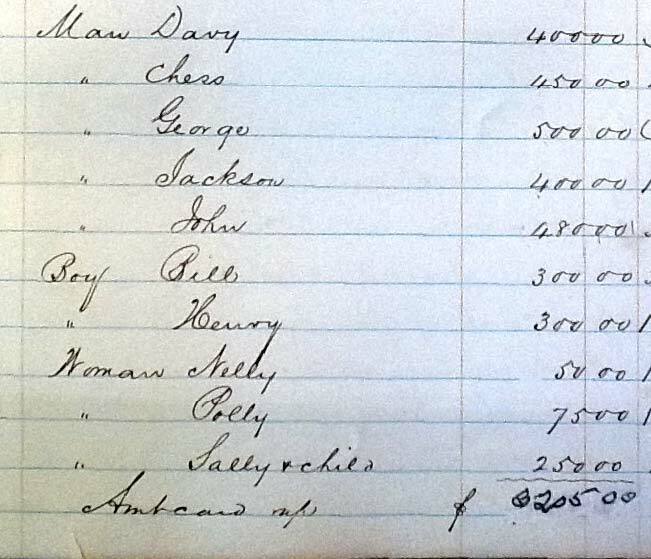 Prince George’s County Register of Wills (Inventories) 1865-1870, Liber AJL1, pp 504-507. Sales of the estate of William M. Bowie, 1863. MSA C1228-32. 1880 U.S. Census, Prince George’s County, Maryland, 3rd District, Upper Marlborough: p 5, dwelling 31, family 31, household of Roderick Addison, Ancestry.com (accessed 5 May 2012); p 5, dwelling 33, family 33, household of Margaret Bowie, Ancestry.com (accessed 5 May 2012); pp 6-7, dwelling 45, family 45, household of Roderick M. McGregor, Ancestry.com (accessed 18 Nov 2011); p 7 dwelling 48, family 48, household of Susan E. McGregor Ancestry.com (accessed 5 May 2012); p 7, dwelling 49, family 49, household of Aaron Addison. Caleb Clarke Magruder, Jr. Nathaniel Magruder of Dunblane. See Sources for full citation.